Lastly, a big congratulations to Emma and Jenny for achieving members of the month this September!! Kitting up novices in cosy fleeces and dry tops, and paddling out as the sun begins to set, casting a phenomenal array of colours over the water and Mountains of Mourne on the horizon. 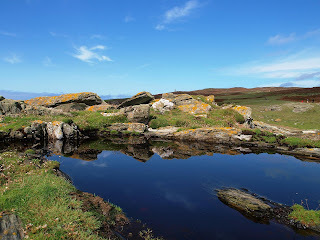 Stillness and calm, with only the occasional sound of the curious seal swimming along behind, diving gracefully beneith the surface. As evening turns to night, we paddle back towards the 'sunset city', round the Castle and back to the beach. Apart from glowsticks and headlamps (to let other waters users know of our presence) we use little artificial illumination - the natural soft evening light is plenty to see by. 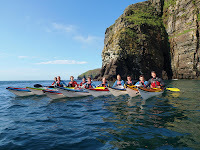 A Relaxed and very pleasant way to spend an evening with a few friends..
held at Holyhead (base of Nigel Dennis's Sea Kayak School and the SKUK Kayak Manufactuing). 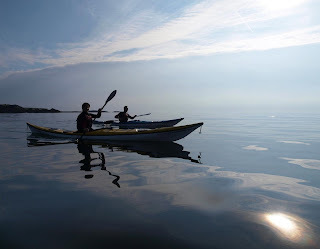 Some delightful sunsets off Treaddur Bay and interesting topics for discussion, including the new Romany RM (plastic) put through its paces by Karin, with a variety of Inuit paddle and hand rolls. 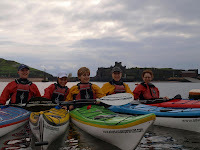 A few pics from the September 'Intro to Sea Kayaking' course, where students have started straight on the sea with us. 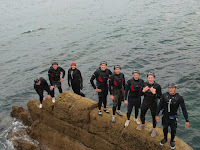 Other have preferred to begin with our indoor pool 'Kayak Safety' courses, covering rescues and core paddling skills. Spaces are available on the October 'Kayak Safety' indoor pool courses running Tuesady evenings at Peel, as well as the 'Intro' and 'Improvers' courses running on Sunday's beginning 05th October. Conditions have been perfect for reaching the Calf of Man, as well as observing the abundant bird life and seal colonies on route. Even for those who would just like to tell the difference between a Cormorant and a Shag, a Chough and a Crow... 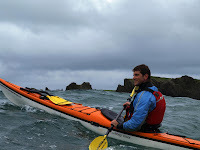 Viewing the Island's spectacular coastline from a different angle, learning new skills and meeting personal challenges and like minded people. All sorts of experiences recently...here's a few of them. There is only room for a few pics here, so if your's is not one of them, drop me an email and i'll get them to you if possible. Congratulations to the lucky 11 year old winner of the Sea Kayak Trip from the Sulby School Raffle, who made best use of her prize with a trip to the Calf with us, well done! 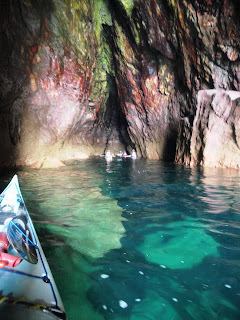 secret places... exploration by sea kayak! Today's forecast was for winds increasing from the South East, veering SW and reaching F8 by late afternoon / early evening... 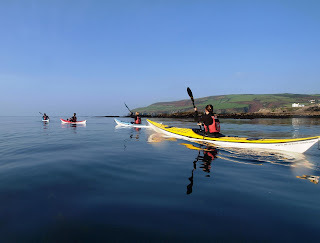 This was what our two students (already completed preliminary leadership and instructional training in their local club in Israel) had come to the Isle of Man to experience. Like all our clients; including visitors from the UK and further afield, they have grown to expect the high degree of customer service and professionalism Adventurous Experiences provide, and feel safe under the guidance of our competant local and experienced staff. 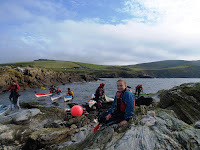 As the introductory day, we chose a sheltered location where we could complete a safe yet challenging trip, rock hopping along the way, keeping in close and using the coastline's natural rock obstacle course to practice edging and manoeuvering. 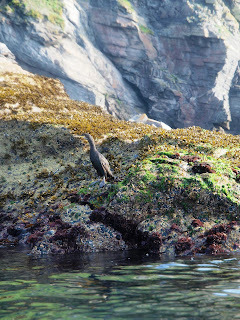 Seals swam about us or slumbered in the intermittant caves, the screeching of Peregrine Falcons from their nest overhead, and still large numbers of Cormorants clustered on the steep angular rocks close by. Then it was time to head out and run with the wind, stopping at a well hidden cave to explore the caverns with Stalactites and waterfall, and have lunch:) Nice place for a few pics, before swimming the kayaks back out and testing some more skills. 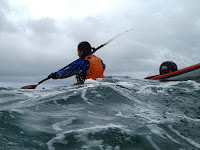 Off the water by early afternoon as the wind strengthened and gusts whipped the sea into a frenzy... Back to the lecture room and planning for tomorrow's paddle! Even with the less predictable and often changable weather, we continue to run safe, fun, learning (and unforgettable) adventurous experiences! 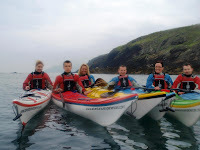 Our 5 - 6 day packages, using high quality local B&B's, giving an active, adventurous day combined with home cooking and luxury accommodation are proving very popular during the 'training season' (running September to May) when we book in many smaller groups and individuals, on beginner, improver, intermediate and advanced sea kayak courses, those who wish to really progress. Some find it more convenient to do this through an intensive block course, (such as the one described) and we cater for these as well as regular weekely sessions for those who live locally, and can only spare a few hours at a time! 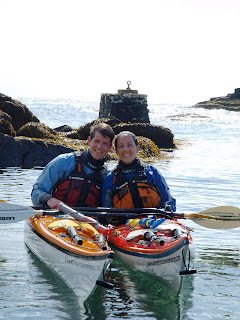 Kayak safety and rescue indoor pool courses begin monthly; alongside certificated Coastal Navigation and Tidal Planning courses - skills necessary for the recreational kayaker and small craft user alike. All sorts of excitement over the past few weeks, with never a dull (or free) moment! 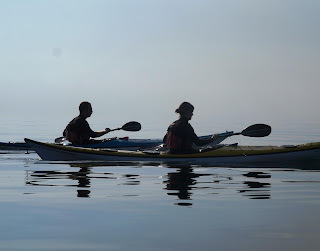 Prior to this the combined new BCU 2* and 3* training and tests organised by Jukka Linnomaa - Sea Kayaking Finland, was great fun and local conditions were ideal for the purpose. Thanks as always to the Linnonmaa's for their great hospitality. To top this, a big congratulations to the two Adventure Club members who progressed their eskimo rolls from the pool to the sea, and are now looking very solid. we're all really happy for you!! Life on the Isle of Man is simply phenomenal! !